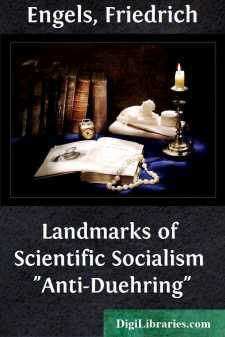 Landmarks of Scientific Socialism "Anti-Duehring"
When Dr. Eugene Duehring, privat docent at Berlin University, in 1875, proclaimed the fact that he had become converted to Socialism, he was not content to take the socialist movement as he found it, but set out forthwith to promulgate a theory of his own. His was a most elaborate and self-conscious mission. He stood forth as the propagandist not only of certain specific and peculiar views of socialism but as the originator of a new philosophy, and the propounder of strange and wonderful theories with regard to the universe in general. The taunt as to his all-comprehensiveness of intellect, with which Engels pursues him somewhat too closely and much too bitterly, could not have affected Herr Duehring very greatly. He had his own convictions with respect to that comprehensive intellect of his and few will be found to deny that he had the courage of his convictions. Thirty years have gone since Duehring published the fact of his conversion to socialism. The word "conversion" contains in itself the distinction between the socialism of thirty years ago and that of to-day. What was then a peculiar creed has now become a very widespread notion. Men are not now individually converted to socialism but whole groups and classes are driven into the socialist ranks by the pressure of circumstances. The movement springs up continually in new and unexpected places. Here it may languish apparently, there it gives every indication of strong, new and vigorous life.